These dumbbells feature durability that simply can't be matched. 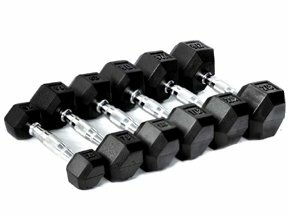 Made from solid cast iron with a 6-sided anti-roll design and encased in rubber, this dumbbell is both stylish and durable. Heads are securely fastened with a uniquely designed pin mechanism that means this equipment is about as low-maintenance as it gets.